Sometimes (okay, all the time) I see things in stores and think to myself, I could make that at home. And this is one of those things. I'd seen these kind of burlap/string/jute covered containers all over the place and decided to make my own. I don't know about you, but I love things that hold other things. I figured I could use this to display paper flowers or to hold some hair brushes. We'll see where it ends up in the house. This is another simple project, but it takes time. Not focused effort, just time. And a lot of glue. 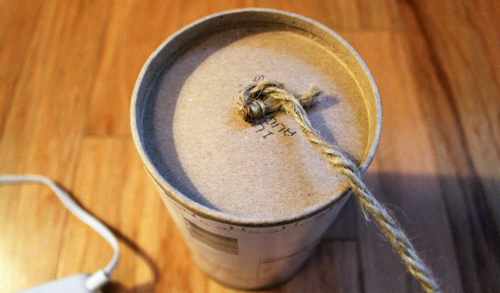 Here's the three items you need: jute, a container to cover, and some hot glue. I started with the bottom and tied a knot to begin the spiral. Then just glue and wrap around the center until the entire bottom is covered. Then move on to the side. Starting at the bottom, apply some glue and start wrapping. It's a good idea to have your favorite tv program on or someone to talk to while doing this, it gets very repetitive, but don't give up! Get it done! And you have yourself a jute-covered container for storage! I think I might use mine for hair brushes. 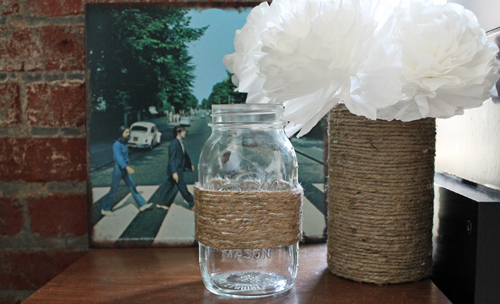 Now, the mason jar is the same idea, just takes a lot less time, and glue. T's grandmother's house had tons of mason jars laying around from when the family used to can tomato sauce. I picked a few up, onces that don't have lids and I thought no one else would want, to use as vases. Decided to spice this one up with some jute! Start by deciding where you want the jute to begin and end. Knowing this in advance is helpful so you don't start getting out of control. Then, glue the end lower then the first section to hide the end, if you can't get it to stay, just cover over it when you wrap around. The just glue and wrap. Because you aren't covering the entire jar, try to find the balance between too little glue and too much. You want it to be a bit neater. And there you go! I'm pretty excited to buy some fall flowers and start using this sweet little vase. 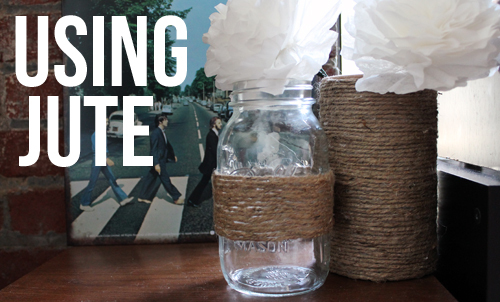 Two simple projects using jute!